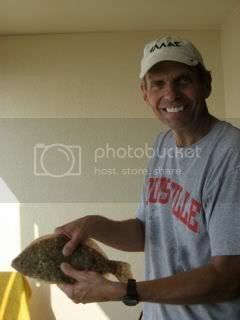 Got this e-mail from my brother Jim this morning and looks like the fishing bug bit him. He and his wife have a condo in Orange Beach, Alabama and he did a little surf fishing this morning. Thought this would be Pacemaker worthy and I told him Carl would be proud of him. 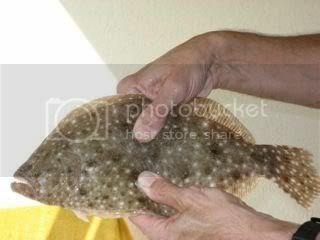 The flounder was caught this morning around 6 a.m. out of the Gulf of Mexico. Used a surf rod, and live minnow. He asked an "old guy" if it was a keeper and he said yes. He caught another fish and the old guy told him it was a silver fish, but not worth keeping. I told him, always ask the old guys, they have the wisdom. He and his wife are going to fillet it and cook it. One of our guys just moved down there....he is starting to learn how to catch those salty fish! Glad to see you're still on the forum. Good to see that Carl hooked another one. What a legacy. The old guys always know!